high level of asepsis (through unidirectional air flow with High Efficiency Filters) and / or monitoring of the internal particle contamination (through particles counting equipment). RABS and C-RABS aim is to provide a controlled environment with high level of protection to transfer and process materials or devices through small openings (called “mouse holes”) designed to enter and exit such equipments. The use of overpressure ensures the integrity of the working area even with the presence of the “mouse holes”, therefore minimizing the risk of microbial or particulate contamination inside the core working area. 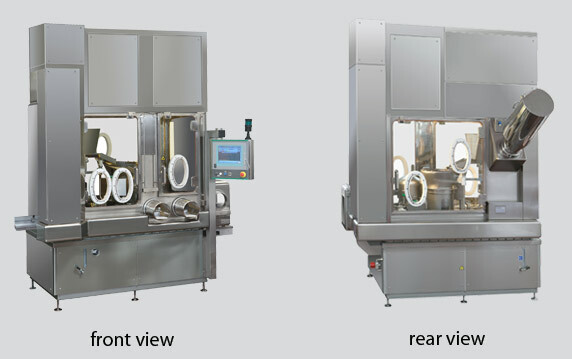 Crimping Cabinet, engineered to provide Class A (100) aseptic area to protect freeze-dried vials during the capping phase, ensuring compliance GMP Annex 1 provisions. Cap Loading Container: to introduce the caps and flange to be connected to the crimping cabinet (capacity: ca. 3000 aluminium caps). 3 chambers: conditioning area, sterilizing area (by VPHP), aseptic filling area. Internals: Unique stainless steel shell AISI 316L (3mm thick) with internal finishing in mirror brite (<0,3μm) and smooth angles of min. 20 mm radius for improved visibility and cleanability. View panels: made of 12mm tempered glass. Unidirectional Air Flow system (predisposed to be connected to a dedicated HVAC system). Filtration through HEPA H14 filters with Pressure Transmitters to control filter obstruction.